St Magnus the Martyr has to be one of the most oddly dedicated churches in London. Indeed, for many years there was confusion over which St Magnus it was dedicated to – candidates including a second and a third century martyr and a Viking who was slain in the Orkney Isles around 900 years ago. Revived interest in the latter St Magnus in the early 20th century thanks to the discovery of his remains hidden in a pillar in the Orkney ‘capital’ of Kirkwall , however, led to a confirmation of the church’s dedication in 1924. There is believed to have been a church on the site since Roman times (a fact which has contributed to the confusion over it’s more recent dedication) but its first known mention as that of St Magnus is shortly after the Norman Conquest. 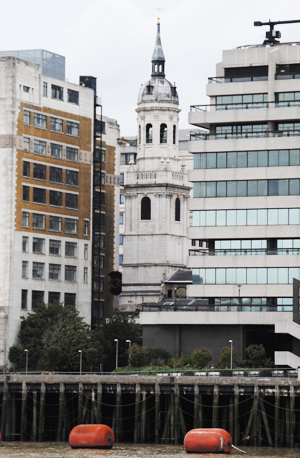 The church’s location, on the approach to London Bridge (see the picture, right, of the church tower overlooking the Thames), meant it occupied an important place in the life of medieval London. Following the Reformation, the patronage of the church was held alternately by the Abbey of Bermondsey and the Abbot and Convent of Westminster – this later passed into the hands of the Bishop of London, Edmund Grindall, and it was he who appointed the church’s most famous rector, Miles Coverdale, best remembered today as a Bible translator (there is a large monument to him in the church). The church had been repaired in the early 17th century but was destroyed completely in the Great Fire of 1666. It was subsequently rebuilt to the designs of the ubiquitous Sir Christopher Wren. A fire in 1760 did considerable damage to Wren’s building but it was restored and improvements continued to be made on a sporadic basis until 1831 when Sir John Rennie’s new London Bridge was opened and the old bridge demolished, meaning St Magnus no longer occupied the ‘gateway’ position it had for centuries prior. The church only received relatively minor damage during World War II when a bomb struck London Bridge but was later restored. Features of the church now include the exterior clock, which dates from 1700, and a piece of wood believed to have one formed part of the Roman wharf which has been placed under the porch. Among those buried at St Magnus’ during medieval times were Henry Yevele, master mason to King Edward III and King Richard II (his monument was destroyed in 1666). The church still has connections to the Fishmonger’s Company and the Plumber’s Company. WHERE: Lower Thames Street, London (nearest Tube stations are Monument and London Bridge); WHEN: 10am to 4pm Tuesday to Friday; COST: Free; WEBSITE: www.stmagnusmartyr.org.uk. Nice post. I visited this church during Open House London this year. I found myself having to brief the attending volunteer, who didn’t know about Miles Coverdale, for example! There is a fabulous model of Old London Bridge inside, made by a parishioner in the 1980s, I think. Have you done St Vedast-alias-Foster yet? There’s a strange name. Popped in there last Saturday, it happened to be open. Another Wren job. Hi Mike – yes, I’ve seen that model – it gives a good insight into what the bridge looked like. We looked at St Vedast-alias-Foster a couple of weeks ago (you can find it here) – always wondered about that one!